Brittany Loring, right, and Liza Cherney, both of whom were seriously injured in the Boston Marathon bombings, lead the procession Monday at the Carroll School of Management commencement ceremony at Boston College in Chestnut Hill, Mass. Before she was seriously wounded in the Boston Marathon bombings, Brittany Loring didn’t have to give much thought to her graduation walk. 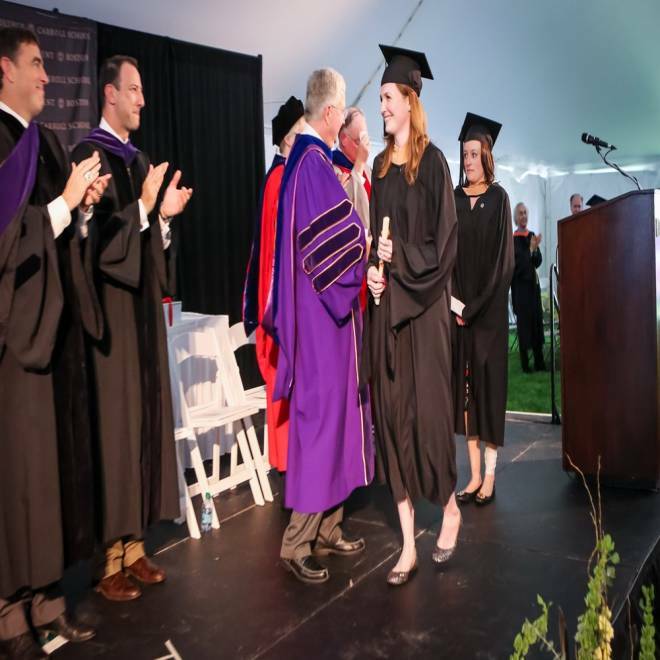 But on Monday, after ditching the single crutch she had been using during her recovery, she walked with a stiff limp to collect her diploma from Boston College’s Carroll School of Management -- passing a “milestone,” she said, as she recovers from the horrible events of April 15. She was joined by a close friend, Liza Cherney, who was also hurt and was graduating from the program. Loring, who earned an MBA degree on Monday, was cheering on friends in the city’s iconic road race as part of her 29th birthday celebration when the bombs exploded. She suffered a skull fracture and concussion, was struck by BB pellets -- including one in the neck and two in the head, and had wounds on both of her upper thighs, likely from shrapnel. After three surgeries to clean and close the wounds, and weeks of occupational and physical therapy, Loring managed to walk for the first time without crutches last week, lasting as long as 15 minutes. She also has begun to venture into crowds again, a daunting prospect for some of the injured, and resumed some of her routines, such as visiting a local café. Loring’s classmates at Boston College, where she will also receive her law degree on Friday, sprung to action in the aftermath, making sure she wasn’t alone and was getting the care she needed. Cards, meals and flowers also streamed in. Boston College said it waived Loring’s final exams and last assignments so she could graduate with her class. On Monday, Loring walked alongside Cherney, who said she was struck by a lot of shrapnel in one leg. The friends bore big smiles under sunny Boston skies. Brittany Loring receives her diploma Monday. “I expect that we will be friends forever," Loring said. "We’re really close and I’m so happy that she’s doing as well as she is and that we will be able to move forward and carry on.” The shared walk in the ceremony “definitely has a lot of meaning for me,” she added. Though it was such an accomplishment to achieve the MBA, Cherney said the day took on greater significance after the attacks. "It is more special because I feel very close to so many people who are graduating with us today, even closer than before,” she told reporters after the ceremony. The pair was among 275 injured in the attacks. Loring will join some of the injured at a local rehabilitation hospital later this week, where she will do outpatient therapy. Eighteen people remain hospitalized after the bombings as of Friday. Doctors haven’t given Loring a time frame for a full recovery, but she plans to walk in her wedding in September and to start her job in international tax in October. Reflecting on the attacks, she said she has had her ups and downs emotionally. To donate to Brittany Loring, her family has set up this fund. And for Liza Cherney, this fund. NBC freelance photographer Daniel Holmes contributed to this report.